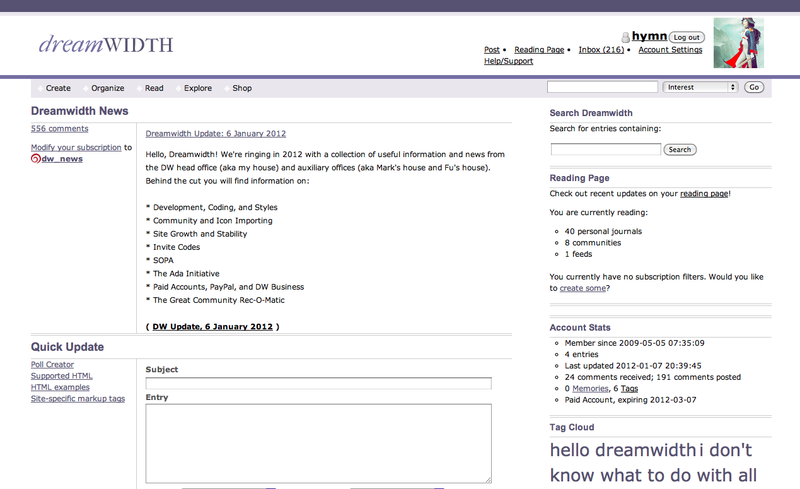 This is a userstyle for Dreamwidth that widens the layout and turns the site a purple-grey color. It works via the Stylish browser extension for Chrome/Firefox. Update!! The latest codepush bonked some of the CSS overrides of this userstyle. Never fear though, I have released an update, which you should be able to install by visiting the userstyles.org page. Update 7/27/2018 — updated links to stylus instead of the de-supported stylish extension. Update 6/9/2013 — fixed the comments to the latest codepush. You can install the update by visiting userstyles.org or by clicking the "check for update" button in the extensions > Stylish > options menu. Update 9/30/2016 — fixed the broken images! You can install the update by visiting userstyles.org or by clicking the "check for update" button in the extensions > Stylish > options menu.